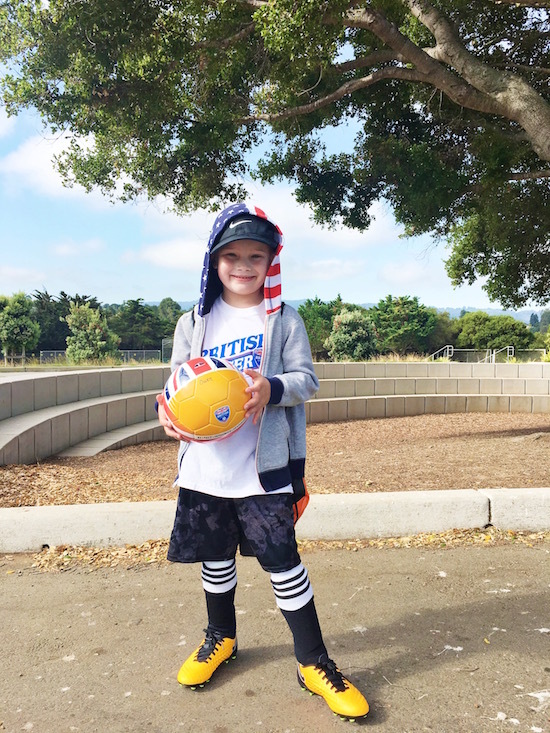 Owen attended British Soccer Camp last week for a week long half-day camp. He has been looking forward to this camp since we signed him up in the spring, and it totally lived up to all of his expectations. From all of his recaps I can tell his was by far his favorite camp experience thus far! This is Owen on the first day of camp! 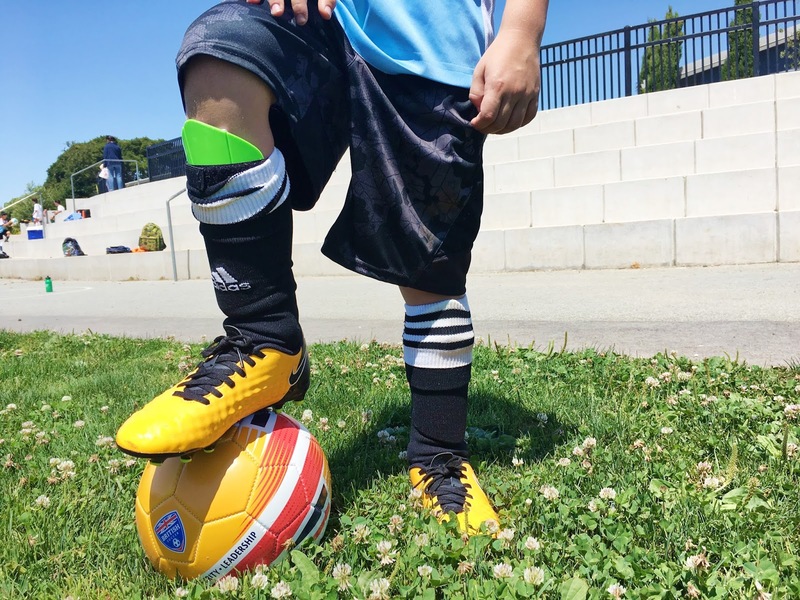 Unfortunately I realized the morning of the first day of camp that I probably should have bought Owen cleats, shin guards and proper socks for camp. I don't know what I was thinking! I blame it on having just moved and my mind being in a million places. They were totally cool with it though, and I promptly ran out and bought all the right soccer gear. By day 2 he was properly outfitted and ready for more soccer! Each morning I would drop him off and check him in by 9am. While the other campers wait for everyone to get checked in they would have some warm-up time with one of the coaches. We had three coaches, two from England and one from Scotland, and they were so great! Always upbeat, enthusiastic to see the kids and very responsible. Since the camp was outside I always slathered Owen in sunscreen in the morning and the coaches made sure to have the kids reapply it themselves every two hours after drop off. Owen tells me that for the rest of the time they would play soccer based games, run little practice drills, obstacles courses, have water breaks and even played some kind of soccer tag! 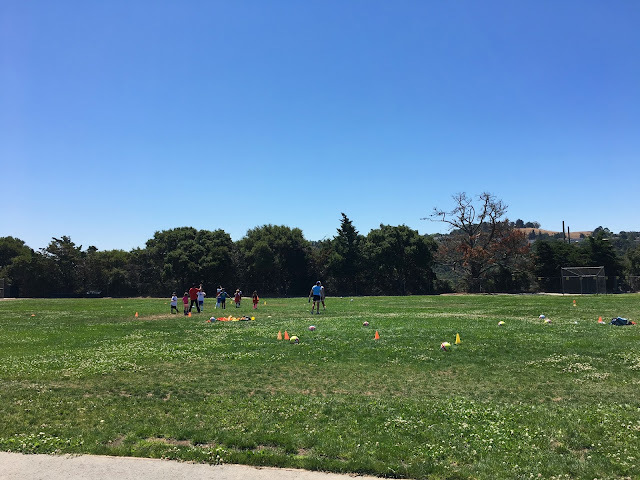 For the last 30 or so minutes of the day the kids played short soccer games with their teams. 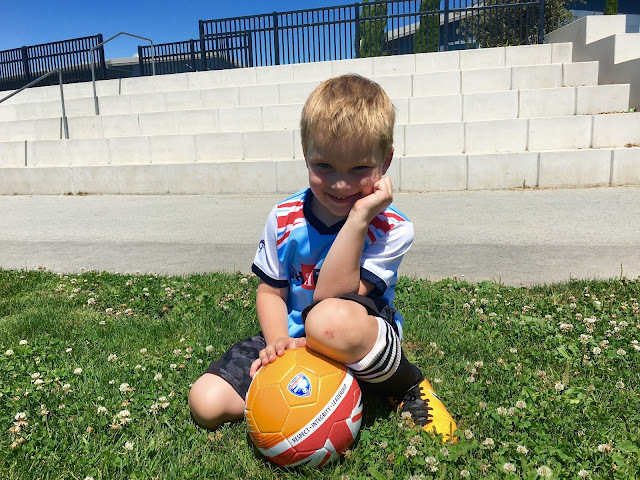 I think this was the perfect camp for Owen to do this summer because he'll be starting AYSO in the fall, so now he's had a taste of what his practices and games might include. Each day the coaches gave the campers a little challenge to do at home that had something to do with their team. Our camp had about 20+ children in it so they were split up into 4 teams, and each team was assigned a World Cup country. Owen's team was Mexico! One day they were told to research an interesting and seldom known fact about their team's country, make a flag in any shape or form (on paper, a cake, out of feathers, etc. ), draw their country's flag on their ball etc. The challenges were optional, so if we had time we would do them, and I though it was a fun way to carry the fun on through the rest of the day. 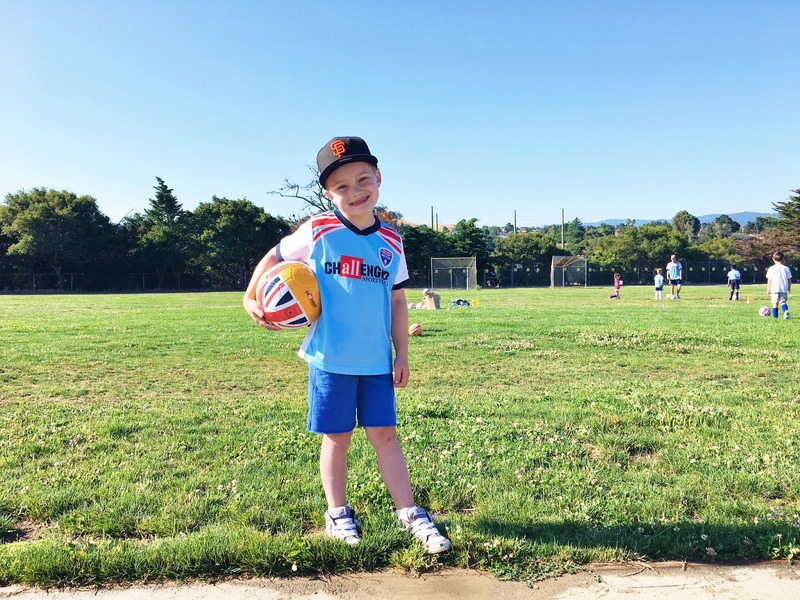 We had such a good experience with this camp that I would absolutely sign Owen up for it again, and I would totally recommend it to anyone looking for a fun half or full-day camp for their kids. The outdoor camps are always his favorite! If you would like to enroll your child in a British Soccer Camp today use the code CAMP17 to receive a FREE soccer jersey, soccer ball, camp t-shirt and poster! What are your kids' favorite summer camps?